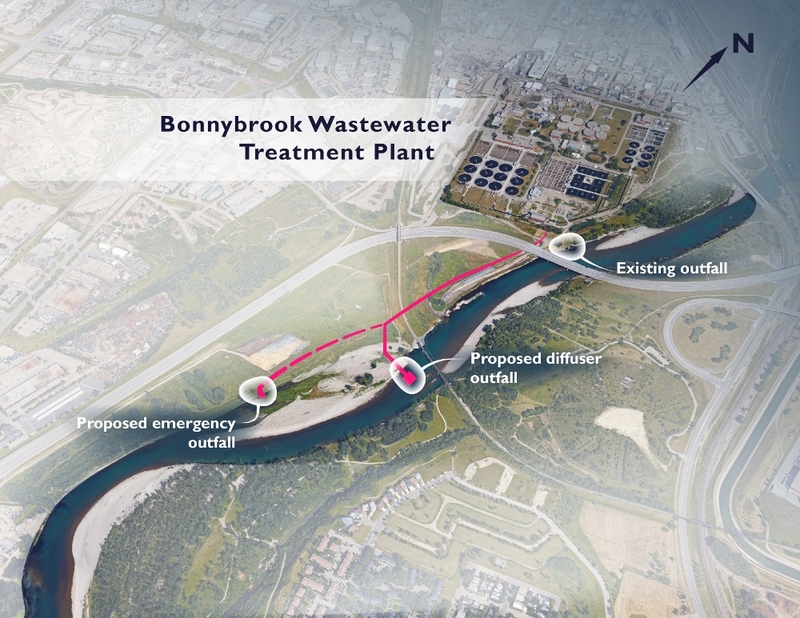 Source2Source Inc. (S2S) has been serving from 2014 through to the present as the hydrotechnical engineering specialty consultant for an approximate $500 million upgrade to the Calgary Bonnybrook WWTP (BBWWTP). This includes serving as the hydraulic engineering design firm on the relocation of the current BBWWTP bank outfall to an in-bed diffuser located approximately 600 m downstream. This outfall relocation project is a critical infrastructure upgrade in response to the 2013 Bow River flood. The outfall works have a hydraulic conveyance design capacity of 1962 ML/D (22.7 m^3/s). S2S is responsible for proposing the diffuser location, designing the conveyance systems, hydraulic structures and outfall diffuser configuration to support the design flow and high performance effluent dilution objectives. S2S also proposed and developed an innovative emergency effluent conveyance channel that reduced the required length of twin 3600 mm x 3000 mm inner dimensions constructed conduits by approximately 350 m thus resulting in an estimated $5 million capital cost savings. S2S further proposed innovative riparian and fish habitat design features to make the proposed emergency effluent conveyance channel a net benefit to the Bow River ecosystem.